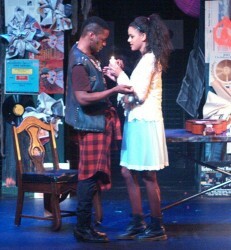 Roger (Randy Dunkle), Collins (Jamar Brown), Joanne (Zaria Stott), and Maureen (Nina Kauffman). Photos by Dave Harton and JilliAnne Grabau. Silhouette Stage’s production of the musical Rent opened on October 25, 2012, at the Slayton House Theater, Wilde Lake Village Center and, sadly, will close too soon on November 4th. Jonathan Larson and his friend Billy Aronson wrote Rent, the Tony and Pulitzer Prize award-winner. 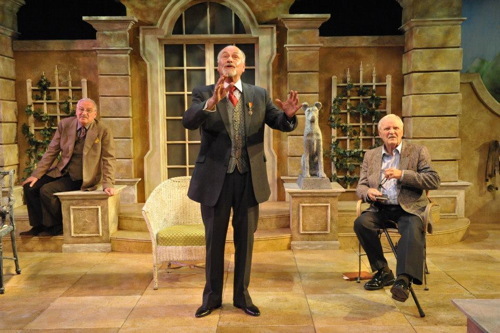 They set out to write a play based on La Bohème, Giacomo Puccini’s world-renowned opera. Puccini’s opera told a story about poor young artists choosing to live in squalor in order to practice their art. Larson came up with the idea to set their updated version in New York City’s East Village in the late 1980’s. Larson and Aronson saw that, although 100 years had passed since the premier of Puccini’s opera, the issues that plague young artists remained basically the same. For instance, tuberculosis, the illness that killed indiscriminately and had no cure at the time, infects Mimi in La Bohème, and it is AIDS, the modern day killer that infects Mimi in Rent. 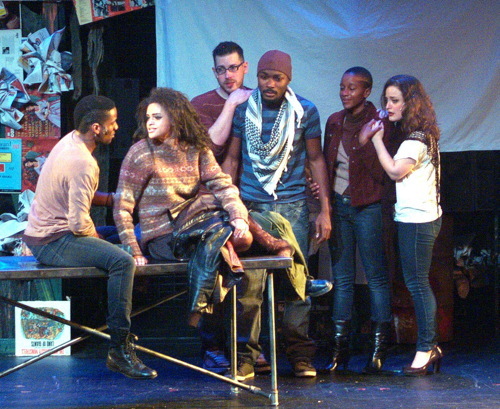 The story of Rent is told though a series of songs and telephone voice-mails, and Silhouette’s production starts off strong with Mark (Randy Dundkle) and Roger (Jason Phillips) singing “Tune Up A.” Phillips is fun to watch and listen to from the first note to the last. He has that kind of ardent talent that makes him entirely believable as a man who, in the space of one year, falls in love, faces his mortality, yearns to write the perfect song, and looses the same love. Two more standouts for talent and enthusiasm are Jamar Brown as Tom Collins and Malcolm Lewis as Angel. The set is well done with punk rock flyers, band notices and old record albums covering all the free wall space, giving the stage an authentic look of an old, rundown warehouse. The live band sits on stage behind a chain link fence and a payphone stands at the side to signify any action that takes place on the street. The only disappointment with the production was with the sound. There seemed to be problems with the sound levels, as several louder cast members would generate feedback when they came to close to the microphones of the softer-spoken actors, such as Caelyn Sommerville as Mimi Marquez. One hopes that this technical kink will be ironed out for the remaining performances. Running Time: 2 hours and one 15-minute intermission. Silhouette Stage’s production of Rent is playing though November 4, 2012 at the Slayton House Theatre, 10400 Cross Fox Ln, Columbia, MD 21044. For tickets call 410-637-5289 or click here.